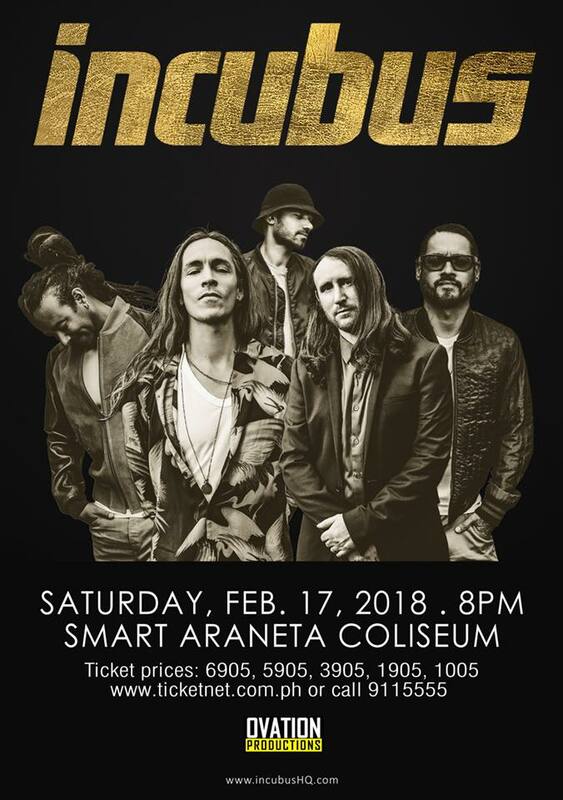 Good news to all Incubus fans in the Philippines, the band is set to perform again live in Manila this coming February 17, 2018. The band that sold over 23 million albums will rock again your night at the Smart Araneta Coliseum with their chart topping hits. If you are planning and interested to watch them live, you have 3-months to save an extra money for this big event. The tickets will be publicly available on-sale this coming November 21, 2017 at exactly 12:00 noon. For those who want to know the ticket prices per level you can see the list of available pricing below. You can also call Ticket Net and Ovation Productions if you are planning to buy VIP, meet & greet packages and to know more information on this Incubus live concert. Where to buy tickets: via online at www.ticketnet.com.ph and Ticketnet outlets or call hotline 911-5555. The band fan favorite songs are Drive, Wish You Were Here, Megalomaniac, Anna Molly, Pardon Me, Are You In?, Nice To Know You and others.